As a little boy, I literally thought I invented the headstand in my backyard. (Did you know, if you grab a hank of grass in each hand it makes counter-balancing easier?) For reasons unknown, I grew up loving the challenges of making my body flip, twist and turn. Born and bred in Cincinnati, my education was in the Cincinnati Public Schools. It was sheer luck that my elementary, Jr. high and Sr. high school were among the few public that had boys gymnastics teams. I was doubly fortunate to have Mr. John ‘Whitey’ Mohr—PE teacher at Kennedy-Silverton Elementary—as my first gymnastics coach and mentor. I continued my gymnastics career while majoring in mechanical engineering at the University of Cincinnati. UC’s men’s gymnastics team was canceled three years after my departure. Looking back, my gymnastics background was determined largely by good luck. After recuperating, I began playing handball at the Blue Ash YMCA (my lifetime sport). After playing one day, while headed to the showers I detoured through the gymnasium and ‘took a tumbling pass’ down the mats. The Physical Director, happened to see this and asked me on the spot if I would like to start a gymnastics team (so much for vetting coaches)! I accepted and quickly fell in love with coaching. I had some success and after a year began to entertain the idea of opening a gymnastics school. At the time there were just a few gymnastics schools in the nation and only one in Ohio. 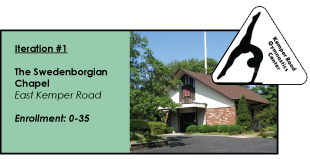 Since I had never stepped foot in a gymnastics school, It seemed to me a good first step would be to start my own tumbling classes at a local church. I was single, singleminded had had very low living expenses. I invested every penny wisely—into uneven bars, balance beams and mats! I’m sure my roommates thought I was crazy. Not only was I never home because I was teaching little kids, crates of gymnastics apparatus and mats began to ﬁll the garage requiring them to park elsewhere. I was on my way to starting a real gymnastics school. Using that garage full of gymnastics apparatus as collateral, I was able to borrow $10,000 from my Mom and Dad and $18,000 from Fidelity Federal Savings and Loan in Norwood. My business partner, Delene Darst and I rented a small 4,500 sf warehouse at 6505 Corporate Drive located at the ‘S’ turn on Deerﬁeld Road, a stone’s throw from Kids First. I spent December of 1974 blindly and frantically converting that warehouse into a gymnastics gym. My Dad was a do-it-yourself kind of man and he passed that attitude down to me. He was a lot of help during the earlier days of my business and vividly remember Dad and I heat-seaming 6 ft. wide carpet rolls I scrounged from a downtown hotel that was remodeling its hallways. 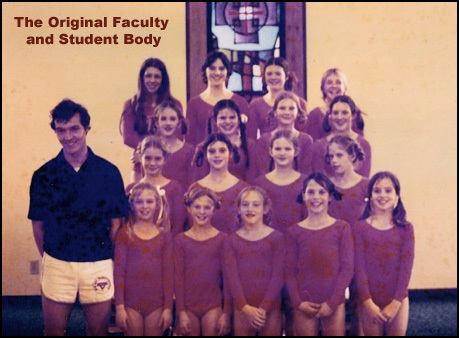 It was a busy and stressful month, yet Queen City Gymnastics Center, Inc. opened on time on January 6, 1975 with 40 students, growing to 75 students by summer and 200 students by the end of the second year. This was the 1970’s and inﬂation was heating up and in fall of 1976 our landlord, Henry Gallenstein, notiﬁed us that the monthly rent would be increasing 25% from $880 to $1100. I vividly remember thinking we can’t afford that kind of shock every couple of years. I was aware of an Al Neyer build-to-suit sign on a nearby 1/2 acre parcel on Deerﬁeld Road, 1/4 mile south of Cornell Road. I phoned Don Neyer and the next day we met for lunch. As we talked, I sketched out an office ﬂoor plan on a napkin, an event Don also recalled as I learned in a conversation he and I had around 2004. By this time we had retired our start-up loans and were debt free so I once again went to the ‘Bank of Mom and Dad’ for a loan to ‘round out’ a down payment on a soon-to-be built 5,800 square foot facility at 11118 Deerﬁeld Road. 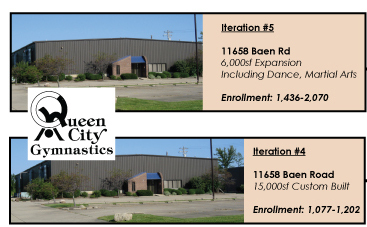 Queen City Gymnastics was the ﬁrst gymnastics school in the Cincinnati area. In fact, I had never even seen a gymnastics school until I turned the key to my very own empty warehouse trying to visualize what a gymnastics school was supposed to look like. At the time I felt ‘disadvantaged’ by my ignorance. However today I believe that the absence of any ‘model’ was an advantage. We had no choice but to think, imagine, invent, try, make mistakes, ﬁx mistakes and try again. There is little doubt in my mind, the innovative attitude that is such an integral part of Kids First’s culture today began in that empty warehouse. Our custom-built, 5,800 sf facility was completed on time, opening for classes on January 6, 1977. It was only 1,300 sf bigger than our Corporate Drive facility but it seemed like a palace! Plus, it had two pits, the first in the USA! Enrollment started at 220 and was growing, but I was no longer happy with the partnership arrangement. My partner, Delene was a great person and honest partner. She also had two children, a husband and a gymnastics judging career and she properly prioritized Queen City third or fourth in her life. I was 10 years younger, single and the business was my entire focus. I felt that I was the one pushing forward to make things happen. The following year I bought out Delene’s half for $35,000. We arrived at that figure by each of us writing a number on a scrap of paper, me, what I hoped to pay, Delene, what she hoped to receive. The figures were $30,000 and $40,000, respectively. We split the difference. It was in this facility where Queen City Gymnastics began to separate itself from most of the gymclubs around and began to capture the attention of our industry. We began to decentralize and operate like a business rather than one man scrambling around trying to do everything and doing it in a mediocre fashion. For instance, it was a huge dilemma whether to hire a full time receptionist or continue to do such duties piecemeal. Looking at our Hospitality Department today, who would ever guess that at one time we operated ‘a cappella,’ without accompaniment! It was in this facility in 1979 that we started Tumblebees, a huge moment in our development. Immediately after that, I received reliable information that a brand new gymclub (a second location for Dynamo Gymnastics) was to open soon about a mile away on Creek Road. I was distressed over this and concluded that we couldn’t expand. The next day was a Friday and I was still in a feel-sorry-for-myself frame of mind as I was driving home after team practice. It was dark and I was passing Gate of Heaven Cemetery when a proverbial ‘light’ went on in my car. Out of nowhere came the literal thought, “I’ll be darned if I am going to let someone else’s plans ruin my plans.” I was light-hearted all weekend and made plans to accept Bill’s offer on Monday morning. It was a sunny spring Monday morning and I remember standing on Bill’s driveway between our buildings and telling him I would meet his price. He looked down and rocked and kicked pebbles and mumbled he wasn’t sure if he really wanted to sell and ‘needed to think about it.’ Despite my youth, I was able to intuit that Bill would not be able to ‘pull the trigger.’ I wasted no time and hopped in my car to canvas the area. Two miles north, on Baen Road, I spotted a parcel with a CUC (Cincinnati United Contractors) sign—For Sale, Build to Suit, 2.3 acres, Call Chuck Kubicki. On this parcel was an older brick ranch that had a bigger-than-life great dane painted on the garage door (my Dad had great danes so I was quite tuned in to them). I phoned Chuck and the next day he picked me up to show me examples of buildings he had built around the city. Ironically one was Soccer World, of Waycross Drive in Forest Park, two doors down from Dynamo Gymnastics’ original location. For some reason this gave me conviction. After our drive, Chuck and I talked in his office about new construction. It was no surprise to learn that the building I wanted to build plus land would cost well more than double the amount of Bill’s building. I explained that Provident Bank was comfortable with me up to $200,000 but I was unsure about any amount over that. Chuck told me he had watched my business grow over the years and that he would loan me whatever the bank would not. It was that easy! What a turn of events. 10 years earlier, I had attempted to rent a building from Chuck who at the time worked for Joe Gallenstein. (Chuck had turned me down because we had no track record.) Since that 1984 project, I have built three more projects with Chuck including the academic preschool due to open September, 2012. Bill remained in his building for 25 more years. After contracting with CUC, I sold our building to our industrial neighbor to the south. Ironically, Chris Vollmer, the realtor for that sale also brokered the new Dynamo gymclub on Creek. From him I learned that Dynamo axed their plans to open because they had heard we were building a brand new superfacility. What I learned from that experience has been invaluable. Innovation has always been a priority in Our Company and many industry ﬁrsts were initiated in these early years. Not only did the Deerﬁeld Road facility have the ﬁrst pits in the USA (I had heard that the Soviets had holes in the ﬂoor ﬁlled with foam rubber from automobile seats), it was the ﬁrst custombuilt, owner-occupied gymnastics school in the USA. Other early ﬁrsts include: Suede covered and padded balance beams (the resin that gymnasts used on their feet to keep from slipping on the wooden beams was gumming up the carpet. I wrapped our beams with ‘Ranchero Naugahyde’ from a local upholstery supply and padded them with neoprene from Netherland Rubber. I took a cross section of this beam to the USGF National Congress only to see AAI featuring padded suede covered beams the following year); spring ﬂoors (I didn’t invent spring ﬂoors but I did craft the system that allowed them to become a standard in every gym, selling hundreds to gymclubs all over the USA and beyond). ‘Innovation’ is the 5th of the Kids First 7 Unifying Principles, a concept we have always faithfully followed and always will. Chuck Kubicki’s CUC crew did a fabulous job completing construction on time and we opened for classes September 10, 1984. Mary Lou Retton had just won the Olympic All-Around and timing couldn’t have been better. We were stunned when we opened our doors with 1077 students and grew to 1124 students by winter. I am not sure how we kept up, but we did. I was exceptionally busy during the summer of construction and took a sabbatical from coaching team with plans to jump back in when we opened in September. The sudden growth required me to extend my coaching sabbatical until January. When January, 1985 arrived, I realized that the nature of our business had changed permanently and my coaching career was over except for helping out now and then. Let me explain what this facility was like, relative to the industry in 1985. In short, there was nothing like it! A 15,000sf custom-built girls and boys gym with nine pits, an in-ground trampoline, multiples of all apparatus and fully carpeted ﬂoors and walls, was unheard of. We had leap-frogged virtually every other gym in the nation by any measure. After the completion of this project I remember saying to my father in law that this gym was the ultimate and there would be no more expansions. He laughed, which is probably the reason I remember saying it. Iteration #4 holds a ton of great memories. It was during these years that our girls competitive programs began to make a mark and our boys program got off to a solid start. Enrollment grew and after a couple years we began to feel squeezed for space. In 1987 I ate my words to my father in law and began to sketch ﬂoor plans for an expansion. This project was to be diferent than the others. In addition to expanding the gym, we would also build dedicated square footage for a 2nd and 3rd product, dance and martial arts. After doing my due diligence I called Chuck Kubicki of CUC and started the construction process. He once again made it as easy as it could be. Iteration #5 was a 6,000sf addition onto the rear of the Baen Road facility that opened on September 8, 1988. It included additional gymnastics space, a dedicated dance room, martial arts room and a small conference room. The conference room was added primarily to support a new teaching venture, The GymClub Owner’s BOOT CAMP, a leadership, marketing and business organizational seminar speciﬁcally for the gymnastics industry. By now we had gotten used to staying on the cutting edge of our industry and the results of this expansion were no diferent. The new wing opened with an enrollment in dance of 251, martial arts 78 and total enrollment of 1,436, a record in the industry. This Iteration lasted 10 years and during this time all of our programs ﬂourished and our competitive programs continued to strengthen. About 1995 we again felt squeezed for space and I began to think about another expansion, as we had a little more land in the rear. I also started thinking about building a brand new facility. I referred to the expansion as the ‘little show’ and the new facility as the ‘big show.‘ The ‘little show‘ would necessarily be limited to a swim school, as our 2.3 acres would be maxed out at that. The ‘big show‘ was much bigger, a lot more complicated and riskier. However, it was the ‘big show’ that excited me so that was where I spent my energy. The ‘big show’s’ development was ﬂuid with lots of changes. To arrive at the ﬁnal version, I dealt with no less than 10 major ﬂoor plans, 3 different parcels, 4 different contractors, 3 partnership groups and 16 lending institutions. Ironically, the ﬁrst parcel of land I found was the one Kids First now occupies. However, the ﬁrst ﬂoor plan I tried to get ﬁnancing for was 43,000sf, exactly one half what the actual size turned out to be. That was the ﬁrst of 15 times I was turned down on ﬁnancing. I have often joked that every time I got turned down on ﬁnancing I added 10,000sf and tried again. The reason ﬁnancing was so challenging had nothing to do with our ﬁnancial record, it was, and still is, unblemished. It was because I was shy on the downpayment plus we didn’t have the cash ﬂow to support the debt service on a $4.5m project. The formula is etched in my mind; the banks wanted our existing cash ﬂow to be able to service the future debt by a factor of 1.25. Ha...our cash ﬂow would handle about 0.50 the future debt service! Clearly, to service the debt we had to grow. I sometimes think I obtained ﬁnancing only because the bankers wanted me to stop pestering them. My ‘proof:’ the very ﬁrst bank that turned me down was the bank that ultimately ﬁnanced the project with SBA guarantees. Thank you Provident Bank for taking a chance. There is no doubt in my mind, given the same parameters, I would never get ﬁnancing today. Something I am hugely grateful for is that we did not have to resort to a partnership with an outside group, something I came close to pulling the trigger on. I had always reinvested the lion’s share of proﬁt back into company growth and I knew I would not fare well with pressures to from partners to produce cash. For the same reason I would hate to manage a publicly traded company where maximizing proﬁt drives most decisions. Because of the numerous ﬁnancing woes, construction for the ‘big show’ began in August of 1997 rather than the hoped for May start. It was clear we would not open in January as we originally planned. As the ‘big show’ began to take shape, its name remained elusive to the point where I was getting worried. We certainly could have called it Queen City Gymnastics and More, or the like but I felt we needed to rebrand since the entire scope was changing. There were many names suggested yet none captured the essence. The name unveiled itself during a light bulb moment as I was rereading a 1996 Cincinnati Enquirer article in which I was quoted, “Kids First, sports second, that’s my philosophy.” I do not remember uttering those words but I certainly remember reading them! The words ‘Kids First’ jumped of the page. 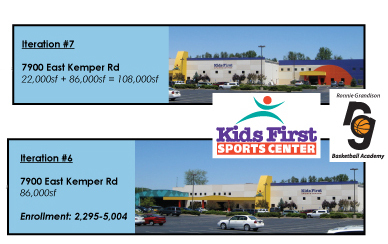 After numerous ﬁnancing false starts, a delayed construction start date and some miserable winter construction conditions, Kids First Sports Center opened its doors on April 6, 1998 with 2295 students. At 86,000sf (unheard of in the industry) this facility once again leap-frogged the industry by multiples. To put this in perspective, 86,000sf is the equivalent of 20 high school basketball courts. The gymnastics ﬂoor alone is 42,000sf (10 basketball courts) and is the largest training ﬂoor in the world to our knowledge. Today, the average gymnastics facility is 12-15,000sf. At opening, we offered all of our current girls and boys gymnastics programs, Tumblebees, trampoline and tumbling, cheer, dance and martial arts. The Beehive and Uneven Bar Cafe were open as well. The Starﬁsh Swim School was delayed due to construction and opened in June. Soccer classes got rolling in November and basketball classes started in March of 2000, as we had only leagues until that time. I cannot stress enough the craziness in the ﬁrst couple of years trying to get it all done. Our Crew was truly amazing pitching in and doing whatever was necessary to keep us aﬂoat. Of special mention was the actual move from Baen Rd to Kids First. No amount of money would entice me to repeat those hellacious four weeks. Huge thanks to current and former Crew Members for working your ﬁngers to the bone. Somehow we got it done. The happenings and changes during the nine years in Iteration # 6 number in the hundreds. Remodels have abounded. Once I did a back of the envelope calculation of our remodels since opening and it totaled over $750,000. The ﬁrst remodel was one of the most expensive. We originally installed two soccer ﬁelds, a small one for instruction, a larger one for leagues. It took about four months to realize the league ﬁeld was a mistake and another month to make the decision difcult to remove it, move the little one where the bigger one was, tear down a wall and reallocate the vacant space to gymnastics. That was a costly mistake by any standards, especially only months after we opened. Enrollment grew until about 2007 and then declined as a result of the 2008 credit collapse. Since then it has remained strong but not as high as it was before the economic malaise of late. It was about nine years after moving in, we began to ‘feel’ like it was time to develop the empty ﬁeld on the east side of our building that was labeled on the blue prints, ‘Stage 2 Expansion.’ After many discussions, it appeared the best use for us might be basketball. I approached our basketball master, Ronnie Grandison. His interest was high and after many more discussions it was decided the best structure would be a rental arrangement with Ronnie. Once again, I phone Chuck Kubicki at Cincinnati United Contractors and over the summer of 2008 we drew up plans for what turned out to be a $1.65M project. In July, the project was ‘blessed’ by Huntington Bank (with whom we had forged a relationship in 2002) and they assured me ﬁnancing would be no problem. In early August, 2008 construction commenced on our new basketball wing. Weather was great and construction moved along fast. The slab and foundation was ﬁnished and the tilt-up walls were almost completed when on September 15 the unthinkable happened: AIG went bankrupt and the credit market slammed shut. That was the source of some sleepless nights. You see, our great relationship with Huntington gave us conﬁdence to give the go-ahead to CUC before loan papers were inked and our great relationship with CUC gave them the conﬁdence to start construction. So, here we were with a project half built and no ﬁnancing. I called Huntington and told them the situation. They had no good answer because they, along with every other bank in the nation, were reluctant to conduct any business in the ﬁrst few weeks after the collapse. Calm heads prevailed and CUC forged on with construction. After a couple months, the credit market loosened up enough for us to close on the loan. No damage done but some tense moments. Opening for business on April 6, 2009, our basketball wing is the home of Ronnie Grandison Basketball. In its 22,000sf are three beautiful hardwood courts. RG Basketball does team training, individual training, classes, leagues and tournaments. The original construction start date was delayed until early August, 2008 due to permit complications. Starting this late would create a challenge to open on time, March 30, 2009. Fortunately the weather cooperated and CUC did an excellent job sticking to a tight schedule, even gaining a little. We would have made our target had we not underestimated the time the specialty hardwood ﬂooring company would need to glue down the sleepers, install the subﬂoor, lay the hardwood, let the wood rest, sand it three times, apply four coats of ﬁnish and stripe it. In addition to three hardwood courts, Ronnie Grandison Basketball has a 2,000sf mezzanine it had sublet to The Edge Sports Conditioning and Personal Training, owned and operated by Steve Lakes. The Edge trains and conditions sports teams as well as individuals, athletes and non-athletes, alike. The Campus at Kids First! Opened January, 2013, The Campus at Kids First has six classrooms in 5,000 sf that was formerly occupied by ‘Recreations Outlet.’ The Campus provides education and care for infants through accredited Kindergarten. The Early Learning industry is highly regulated and once again we called on Cincinnati United Contractors. As always, they did a top notch job with top-notch materials. A color pallet of muted green and orange and our half-wall, ‘open-classroom’, concept gives The Campus has a warm, inviting feel and a sense of community amongst the children that is unmatched anywhere. Completing the picture are solid-wood furnishings, grade-A learning tools and, most importantly, amazing teachers. Throw in the daily physical education opportunities integrated into the curriculum and provided by Kids First Sports Center and it is easy to see why The Campus is the premier place for young children to gain a foundation for growing into happy, healthy, responsible adults. Enrollment growth at The Campus has been steady and impressive. Opening its doors in January, 2013 with 17 students, it was only 18 months before capacity was reached in most age groups. An especially proud moment in The Campus’ history was September, 2014 which saw the opening of its accredited Kindergarten. In this first year, 50% of our Pre-K families opted to send their child to Kindergarten at The Campus.